The Chateau de Montauban is believed to be where the great French writer, Alphonse Daudet often spent his summers. The castle of Montauban, like many buildings in France, exhibits excellent architecture with historic charm. 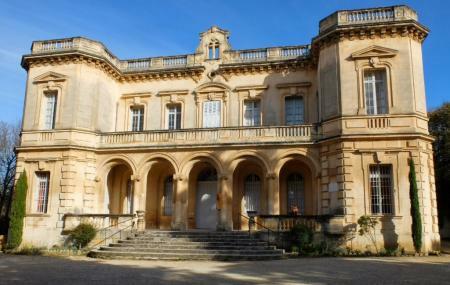 It was built in 18th century, across an area of 12 hectares. The Alphonse Daudet museum which unveils the memoirs of the great author and consists of exhibits like the desk where he write, his first editions of books etc. The museum also consists of an exhibition called the ‘Stories of Fontvieille’ which holds thematic rooms showing provincial figurines, traditional dresses, depictions of bull-fighting games, paintings of Leo Lelée and much more. The park of the castle has been converted to a site for the celebration of various traditional festivals. A shop that offers major works of famous writers and Arterra figurines. You can obtain a souvenir from this shop. For a lover of Daudet’s works, the Chateau de Montauban is a true delight. How popular is Chateau De Montauban? People normally club together Opera Theatre D'avignon and Camping La Couteliere while planning their visit to Chateau De Montauban. A visit to the Chateau de Montauban will give you great overview of life in Fontvieille and Alphonse Daudin's ties to the town. It's interesting to learn how the Mas became a 'chateau'. The gentleman in charge was very pleasant and available to answer any questions. I love that they have an exhibit of a Spanish born, French Toreador named Manolo! Je suis allée au Château, hors période d'ouverture. Je n'ai donc pas pu le visiter à l'intérieur, mais j'ai aimé les extérieurs du château. Et le château en lui-même est très joli. J'y retournerai.